Hijab is the Muslim dress code for women. It is typically interpreted to permit only the hands and face to be visible in public. It also refers to the headscarf that covers the head but not the face. The niqab is a cloth that covers the face. It can reveal the eyes or have a mesh or veil that covers the eyes. Seeing through the veil is reportedly no more difficult than seeing through sunglasses. The burqa is a loose-fitting outer garment that covers the body and includes both the niqab face covering and hijab head covering. The hands and face are often treated together, with customs saying either that they may both be visible or must both be covered. In the latter case, women often wear gloves. The Arab world has many local customs, of course, and there are many variations. For example, the chador is an Iranian cloak without fasteners that is held closed in front. Demands on men are minimal by comparison, often interpreted to require covering the knees and avoiding jewelry. France banned “ostentatious religious symbols” like the hijab from public schools in 2004. Nicolas Sarkozy (then a French minister) justified it this way: “When I enter a mosque, I remove my shoes. When a Muslim girl enters school, she must remove her veil.” Turkey also prohibits the hijab in schools and universities. The French law was extended in 2010 to ban face covering in public, including the niqab. A Muslim-American woman is the second-best saber fencer in the U.S. and is hoping to represent the U.S. in the 2012 Olympics, even though it will fall in Ramadan, the month when she will be prohibited from eating or drinking during the day. She conforms to hijab and was attracted to the sport because the uniform (inadvertently) also conforms to hijab. From a Western standpoint, it’s easy to see the hijab requirement as oppressive, though from the inside it can be seen as a matter of cultural identity. A cultural demand doesn’t always vanish when that demand is lifted. During the Qing dynasty (1644–1912), Manchu rulers imposed queues (long ponytail with an otherwise shaved head) on Chinese men. Not wearing one was considered disloyal and a capital crime, but when the dynasty ended, many men still wore the queue as a custom. A fascinating example of unexpected consequences came when wearing the veil became mandatory in Iran after the 1979 revolution. Protest came from an unexpected quarter—women who had been wearing the veil. Before, they could publicly say, “God is great” by wearing the veil in public. After, they were simply obeying the law. Imagine a Christian theocracy in the West that made wearing crosses mandatory. The same thing would happen to the cross as happened to the Iranian veil—the cross would no longer be a religious statement but a political one. I wonder if there’s something of this kind of unexpected consequence with Christian morality. Do Christians do good things just because they’re the right thing to do? That is, do they do good things for the same reasons that atheists do them? Or do they do them because God is watching? Whether God is tallying up good and bad actions that will confront the Christian in heaven or the Christian is simply trying to put a smile on God’s face, I wonder if the Christian moral motivation is shallower than that of the atheist. 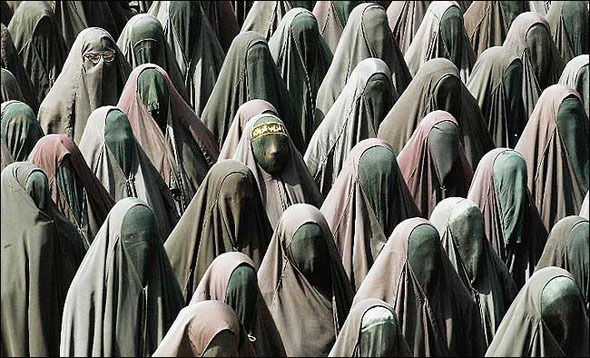 This entry was posted in Other Religions, Words and tagged Burqa, Chador, France Face Covering, Hijab, Iran, Iranian Revolution, Manchu queue, Muslim Veil, Muslim-American Fencer, Niqab by Bob Seidensticker. Bookmark the permalink. My favorite story about mandatory clothing came from Denmark, right after it had been conquered by Nazi Germany during WW2. Shortly thereafter, the Nazi regime mandated that all Danish Jews had to wear yellow stars of David on their clothes. The following day, the king and queen of Denmark (still in office as figureheads) rode all over Copenhagen in an open carriage, pointedly and prominently wearing yellow stars of David. By the end of the week, everyone in Denmark was doing likewise. My kinda people, the Danes! A little like JFK saying, “I am a Berliner,” except that JFK wasn’t risking his life by saying it.